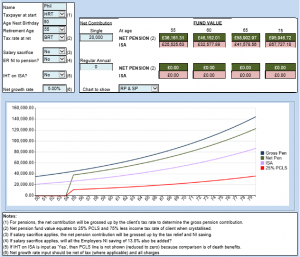 The Pension vs ISA investment calculator provides a basic comparison of the fund values of a pension and ISA investment based upon an initial level of investment. Following the 2014 Budget announcing the new proposed flexibility of withdrawing income from pension funds, there is a lot more interest in pensions and whether clients should contribute to a pension or ISA. The pension contribution is grossed up by tax relief, depending upon tax rate of the client. If the pension plan is set up by a salary sacrifice arrangement, then the contribution is further increased by the National Insurance (NI) saving made by the Employee. There is also the option to include the Employer NI saving to be added to the pension contribution. To provide a fair comparison, 75% of the pension fund at the end of term can be taxed at the appropriate rate applicable to the client at that time. The other 25% of the fund is the Pension Commencement Lump Sum (PCLS). There is the option to show whether the value of the ISA fund is subject to inheritance tax.